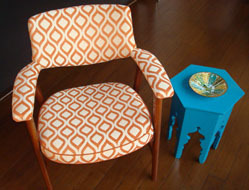 my re.generation ( www.myregenerationshop.etsy.com) reused, recovered, and redesigned mid century and vintage home furnishings that have been made new through regeneration. Re.gen.er.ate - (ri-jen-uh-reyt) to recreate, reconstitute, or make over, especially in a better form or condition. Hi, I'm Interior Designer, Tina DeLorenzo and I began redesigning vintage and used furniture out of a frustration with the quality that is available in a mass market today. We live in a disposable society and that is the way that many things are manufactured today. Furniture of yesterday was solid, well constructed, and made with pride in the USA. I love the feel of an old piece of furniture and the memories that are evoked when a piece reminds me of my youth in the 60's and 70's. I like to take something that looks old and dated and paint it a glossy color and put an interesting fabric on it so that it is almost unrecognizable from its original state. 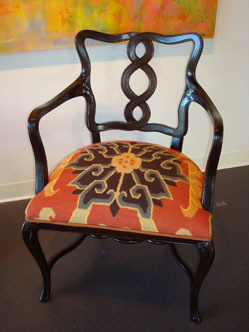 I choose pieces for their unique qualities and form, and redesign them with professionally executed custom paint finishes and re-upholstery. My Etsy store and Cincinnati showroom pieces are colorful and bold and will appeal to anyone who has a penchant for the past, wants a boutique piece or a statement look. 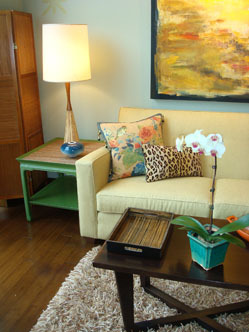 In addition to up-cycled furniture, my store showcases custom pillows made of vintage fabrics, mid century lighting, art, glass, pottery, and more. If you're in Cincinnati, please call me at (513) 708-6996 for an appointment at my Cincinnati showroom at 4405 Brazee Street in Oakley! Not in Cincinnati? Check out my online store at www.myregenerationshop.etsy.com to see some current offerings!